The best water filter is one that can treat your whole household! Thanks for installing the Ecovortek Unit. 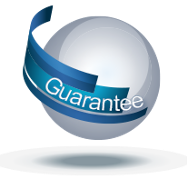 So far have noticed clothes are softer and cleaner and hair is much more manageable – don’t seem to need much conditioner and definitely no chlorine smell in the shower. 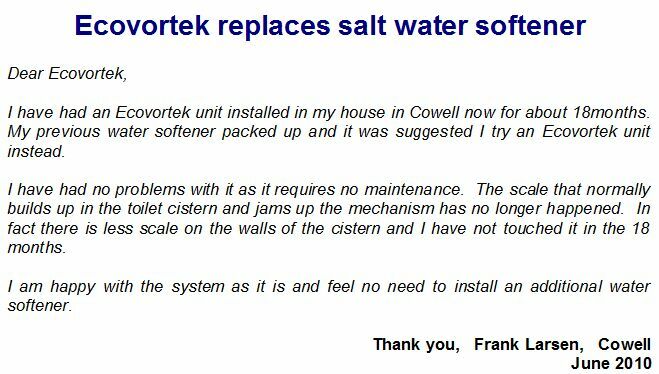 I installed the Ecovortek into a new home that is currently running off of a mix of rainwater and mains water until the Winter rains fill the tanks. I now drink water directly from the tap, whereas previously I would stick to spring or filtered water. I have also found that I require much less dishwashing liquid, as the water seems to soap up much more with the Ecovortek. I love that there is no maintenance required. Once installed, you can just forget about the unit and let it work for you. I have just had your Ecovortek Universal Unit installed into the mains of my home at Brooklyn Park. I have country origins and have always drunk rain water. 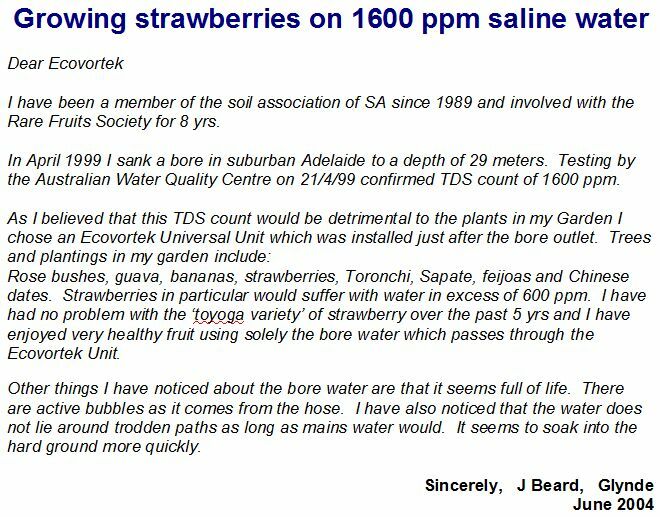 I have not liked the taste and smell of Adelaide mains tap water. Within days of the Ecovortek being installed I happily drink the tap water. Like a good wine it is smooth and easy to drink with no offensive odour. My hair is softer and in better condition and I need less shampoo. I love the no clutter under the sink that comes with an RO process. There are no extra taps, super simple and super efficient on all levels. No maintenance. How could you not have one? I purchased an Ecovortek unit and applied to the mains water for our property at McLaren Flat in 2007. It was not a prime intention to condition water for the house as we already had a filter installed in the kitchen. 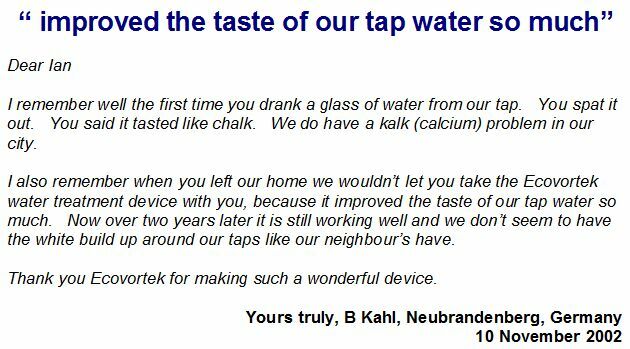 However as the house was also receiving the Ecovortek treated water we could not but help notice the improved taste from the kitchen tap. It tasted as good as the filtered water. My wife also commented the water in the shower made a real difference to her washing her hair and definitely made it feel softer. 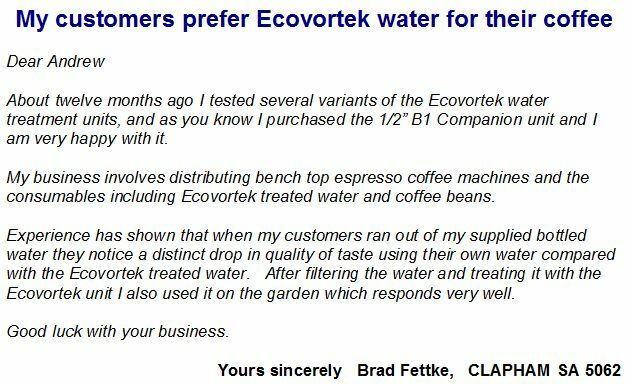 As you know we bought an Ecovortek Universal Unit in 1999 and we have been very happy with our mains water ever since. I thought you would be interested in what happened recently to a friend of mine. She was renovating her home and could not use the bath room so came around daily to shower at our home. On the first day she rushed in, showered and rushed out again saying how lovely it was showering in rain water. I thought to myself but we don’t have rain water in the shower! The next day she came again, showered and commented on how lovely it was to shower in rain water. She said “it has a lovely feeling on my skin and my hair is so much softer”. I told her that we don’t have rain water you’re showering in mains water that has been treated through an Ecovortek unit installed by the water meter nearly ten years ago. It’s a wonderful product and well worth the money. 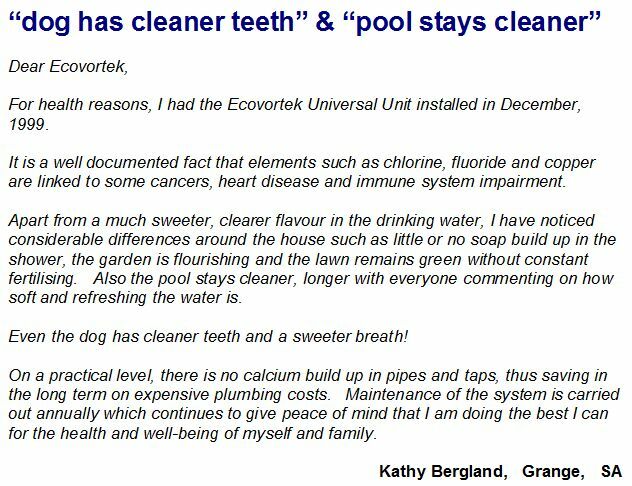 I am writing to let you know of my experiences with one of your Ecovortek units. I fitted an undersink unit a couple of years ago to a kitchen tap that is fed by a rainwater tank and is basically only used for drinking water. There is a pad type filter on the outlet of the tank to remove solids, etc. Before the Ecovortek unit was fitted, it was necessary to clean this filter every 3 – 4 weeks, otherwise the water would taste horrible. Since fitting the unit, I have noticed that this filter can be left for anything up to 8 weeks before there is any noticeable taste in the water. 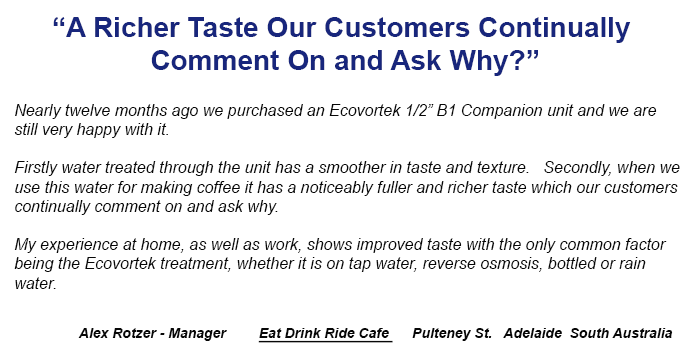 Since fitting the Ecovortek unit I have noticed that the water tastes really good and refreshing to the point where it is easy to keep drinking more. My work takes me to various country locations and I always take my own supply of drinking water from home. However, recently I was away for an extended period and ran out of my home water, so I bought a container of spring water. The surprise to me was how bad this water tasted and also how it was “dead”, it was just completely flat with no energy, to the point where I could not bring myself to drink it. 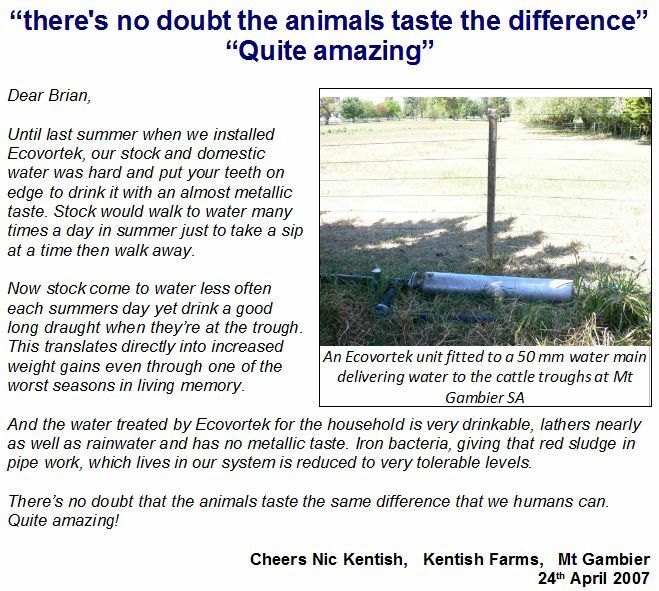 It was this experience that made me realise how good and alive the Ecovortek water is, something that was not really appreciated until I had something to compare it with. Just a few lines in regard to the installation of Ecovortek at Thuruna Camp Site. Prior to installation there had been trouble with Calcium build up in the Hot Water System, which proved an inconvenience and a costly situation. We have now overcome the situation of Calcium especially during summer time. We are using rain water during the Winter. So frankly, we have obtained the best of two worlds. Really with my experience I cannot understand why your product is not installed on all houses on Eyre Peninsular.